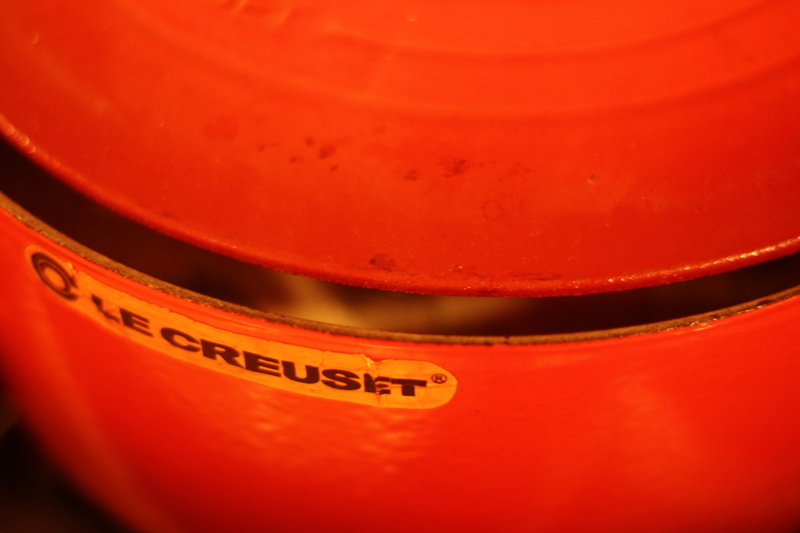 Start by browning 1/2 pound of bacon in your Dutch oven. 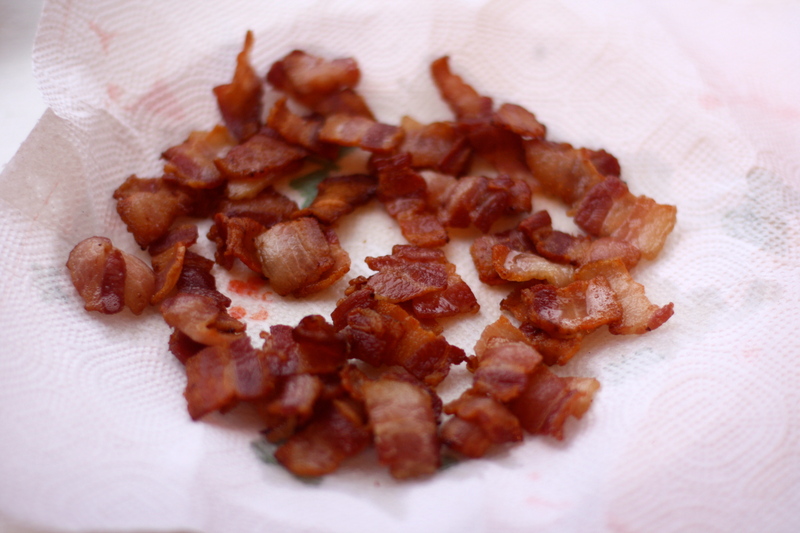 Then remove from pan and transfer to a paper towel lined plate (any dish that starts with bacon is pure gold in my book). 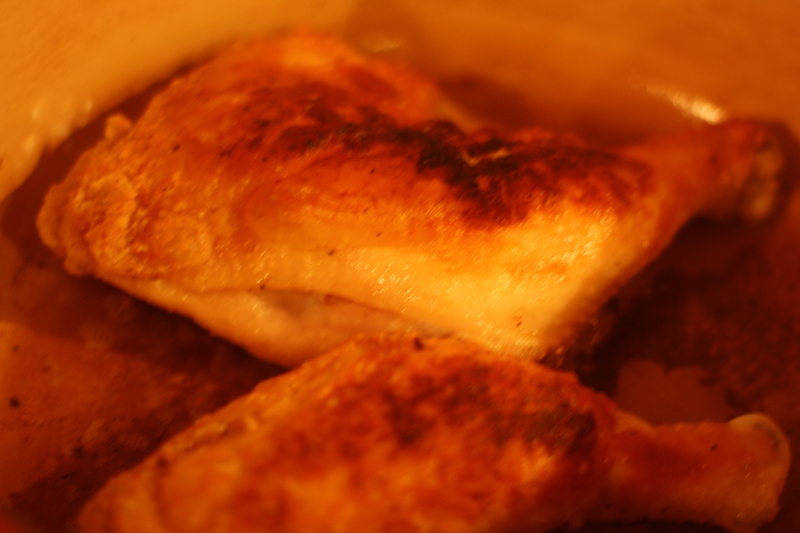 Next, the chicken. 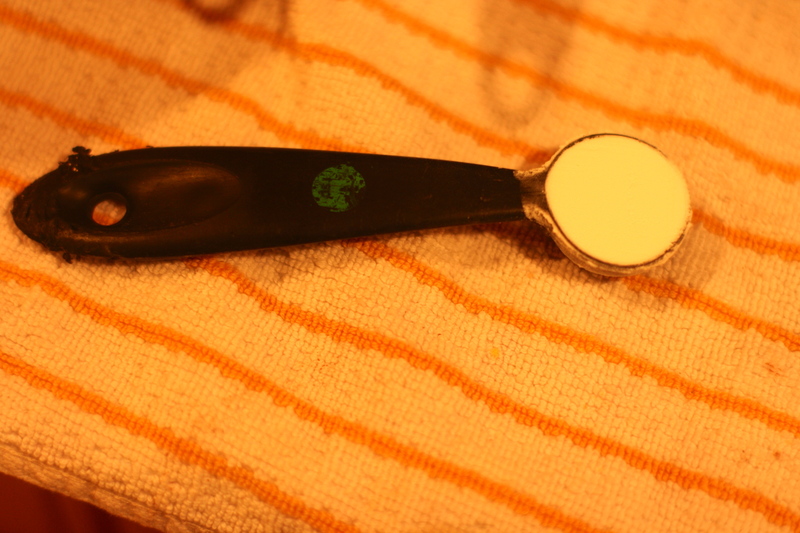 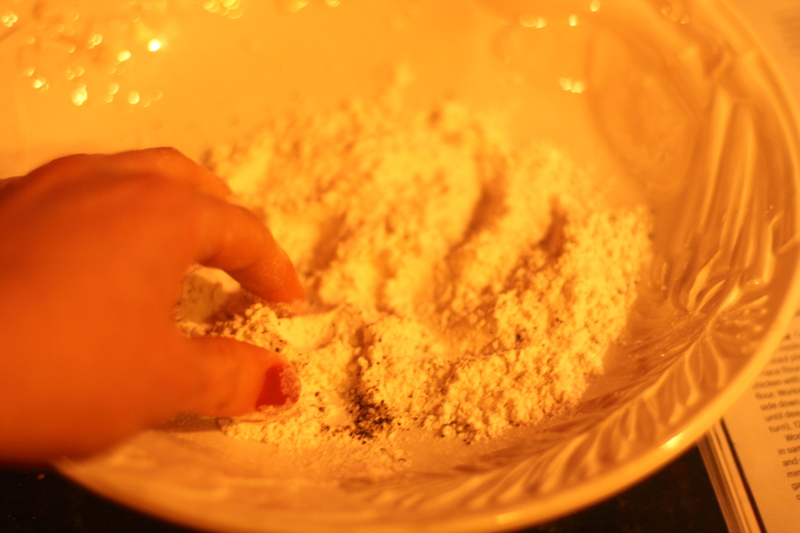 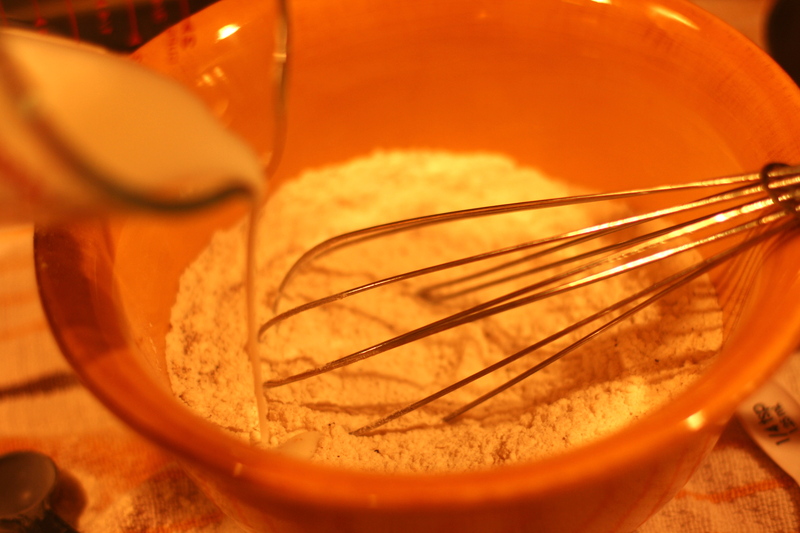 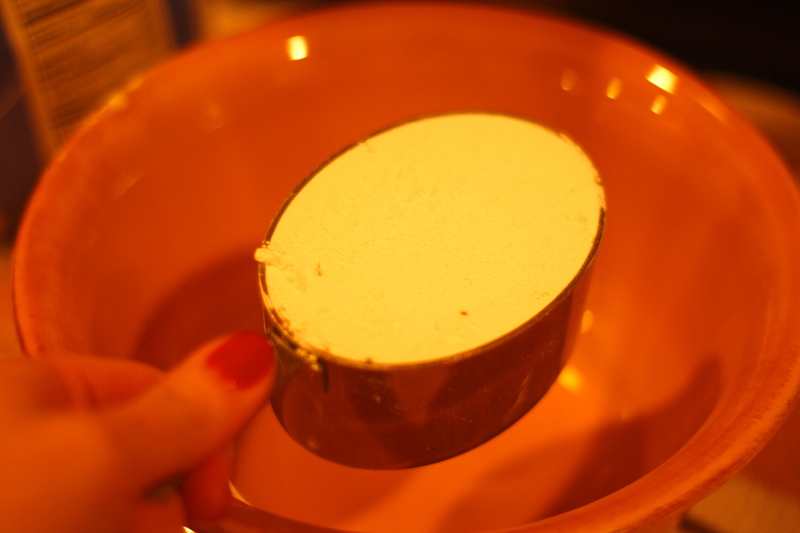 Combine 1/4 cup flour, kosher salt, and freshly ground black pepper in a shallow bowl. 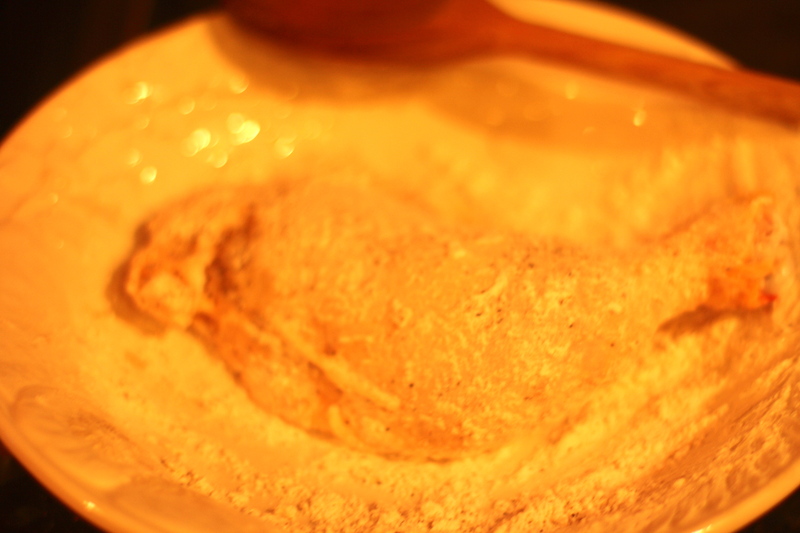 Coat the four chicken legs in the flour mixture. 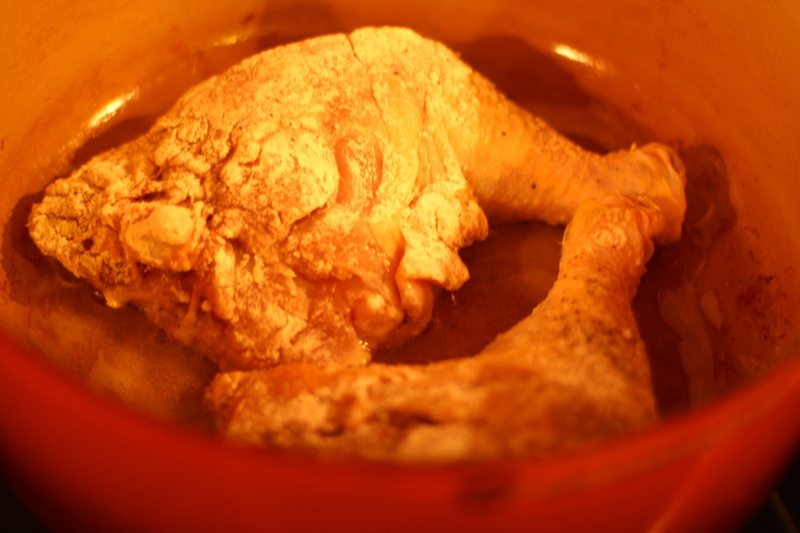 Using the rendered bacon fat (*swoon*), brown the chicken on all sides. 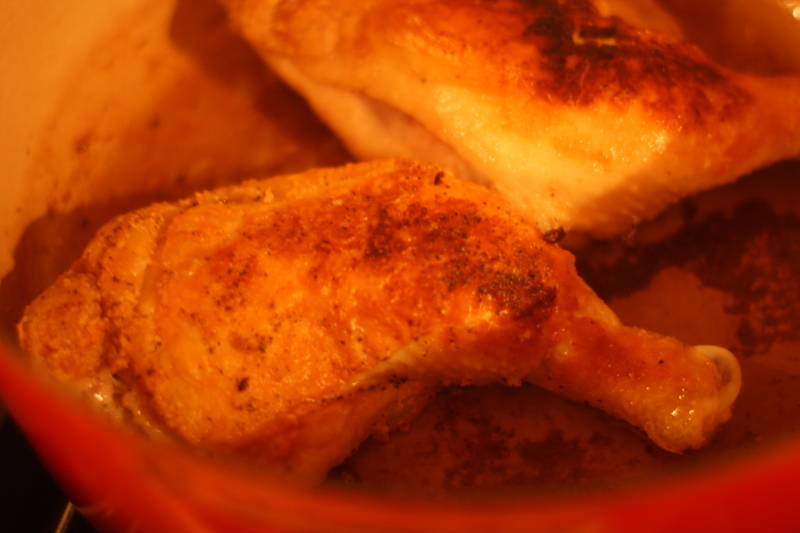 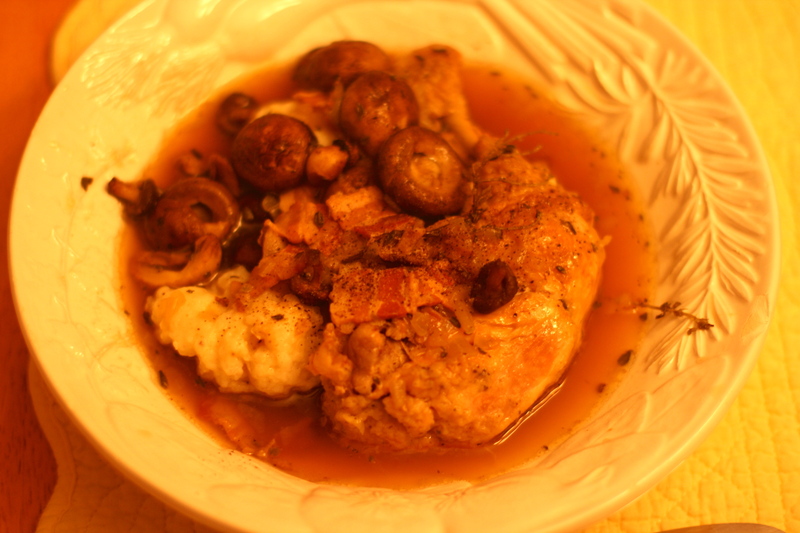 But take care not to cook the chicken all the way through (it will cook later on in the stew). 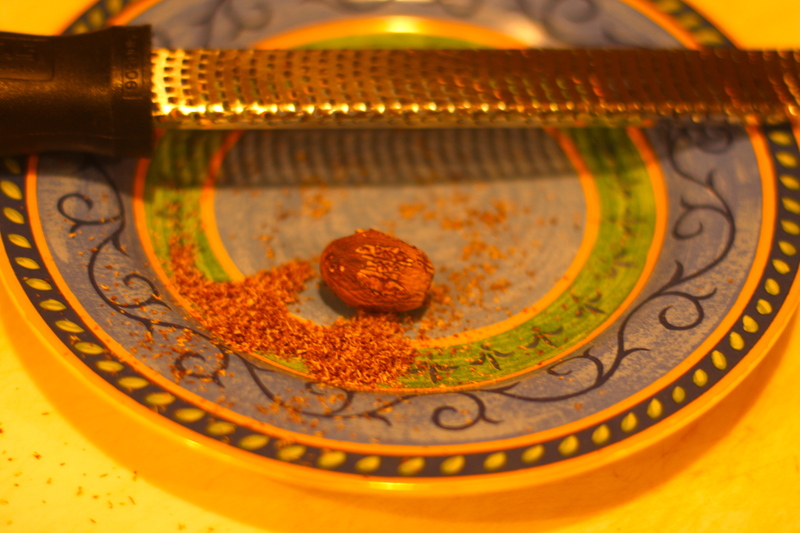 Transfer to a plate and reserve. 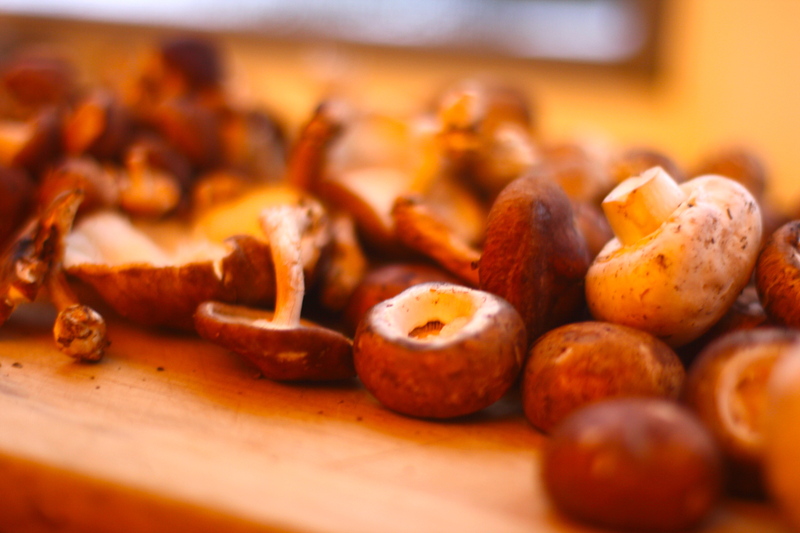 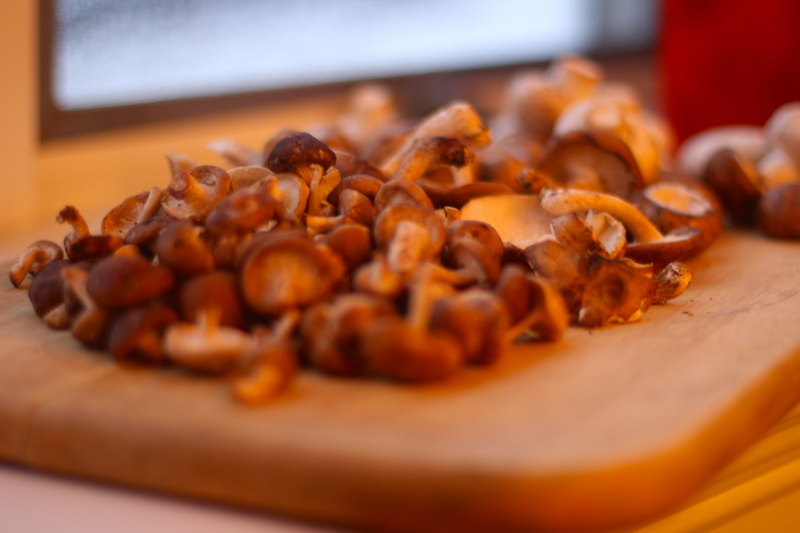 Enter: an army of mushrooms (a 1 & 1/2 pound army to be exact). 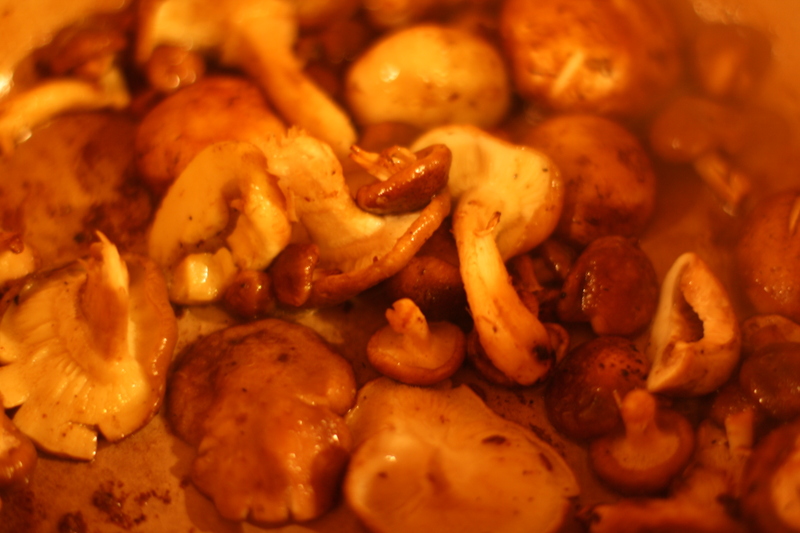 I used a mixture of shiitake, cremini, baby shiitake, and white button mushrooms. 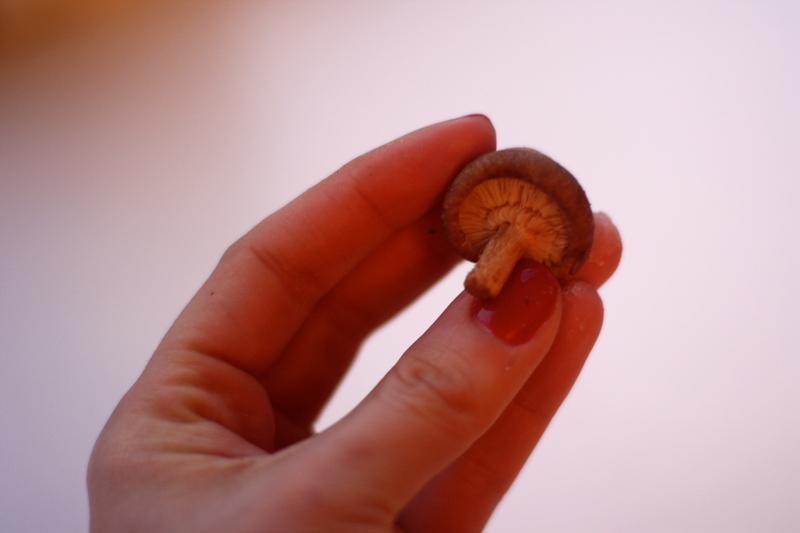 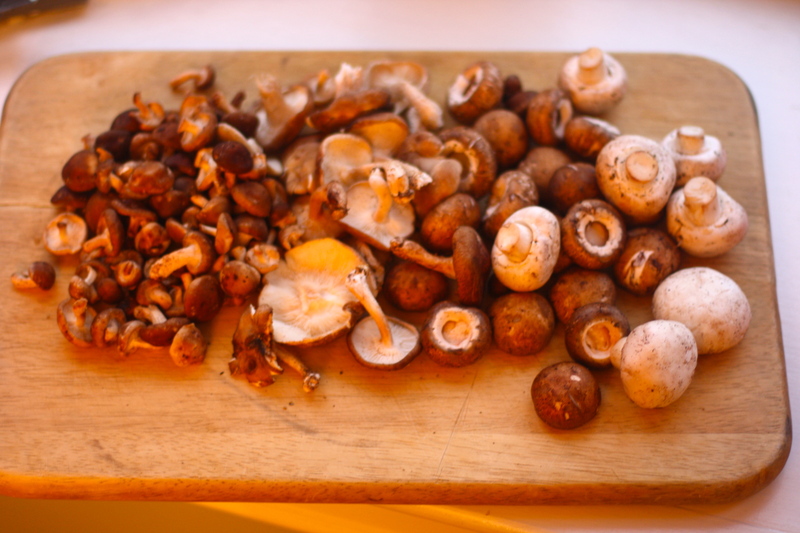 Removed from the pan and reserve the mushrooms. 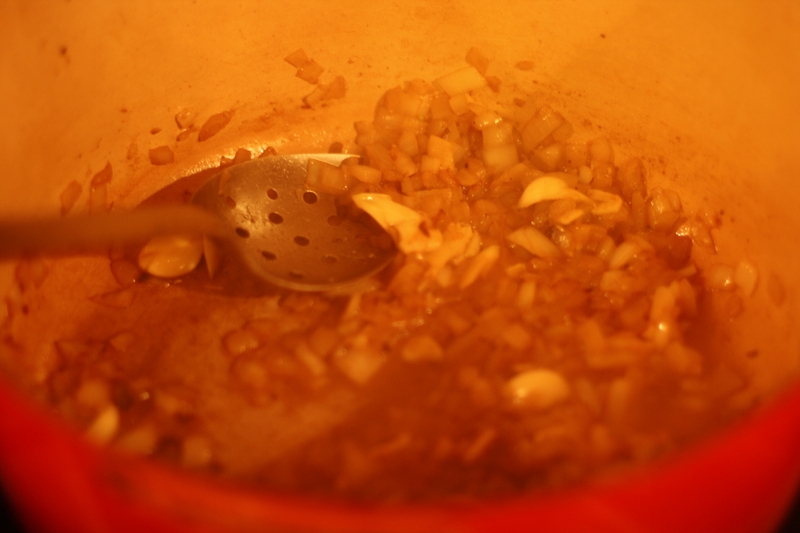 Dice one medium onion and crush six cloves of garlic. 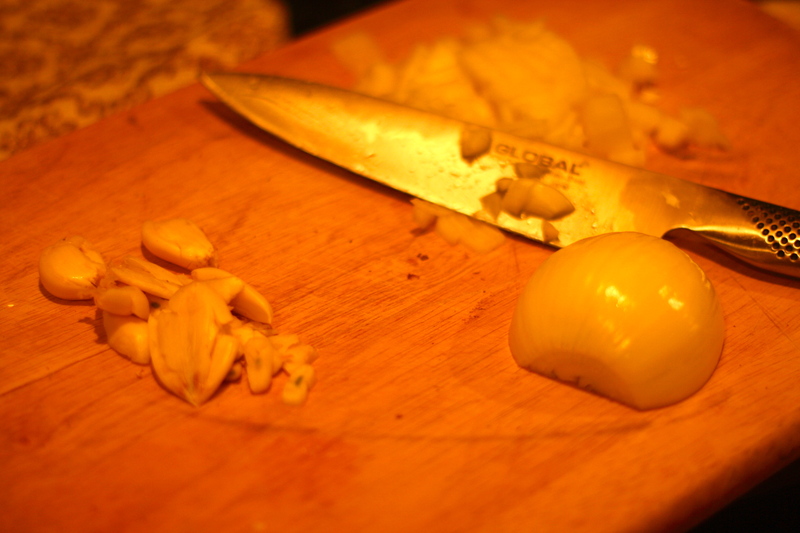 Cook the onions and garlic until translucent and fragrant, respectively. 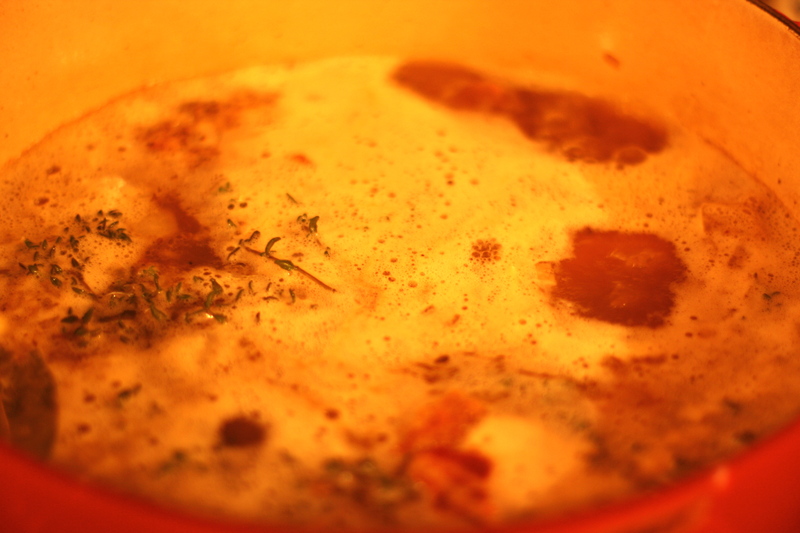 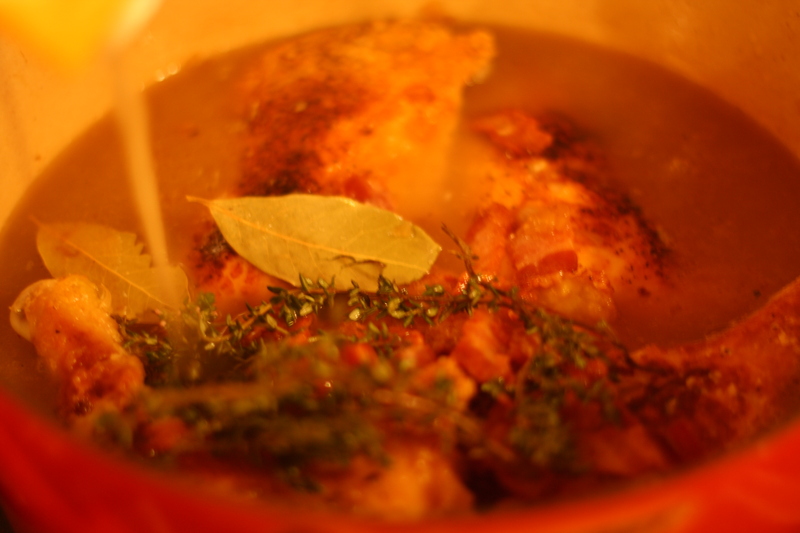 Return the browned chicken and bacon to the pot and add 8 cups low-sodium chicken broth, 2 bay leaves, and 6 sprigs of thyme. 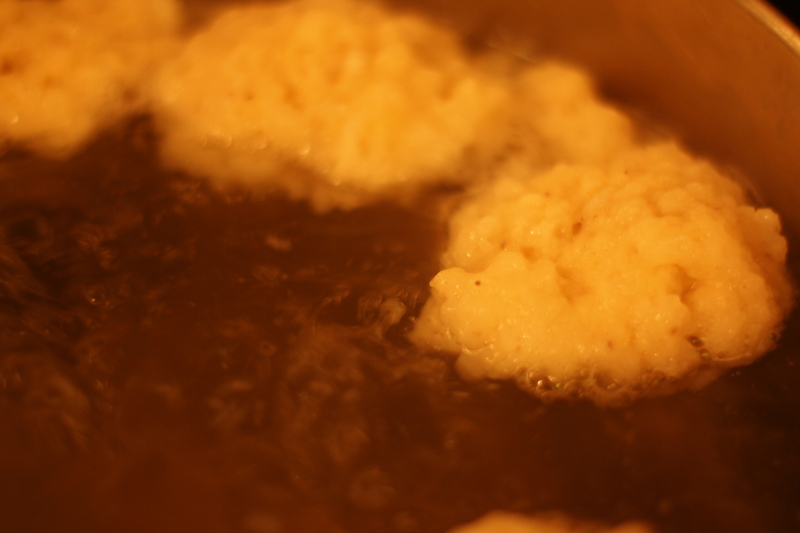 Next, comes the fun part- dumpling time! 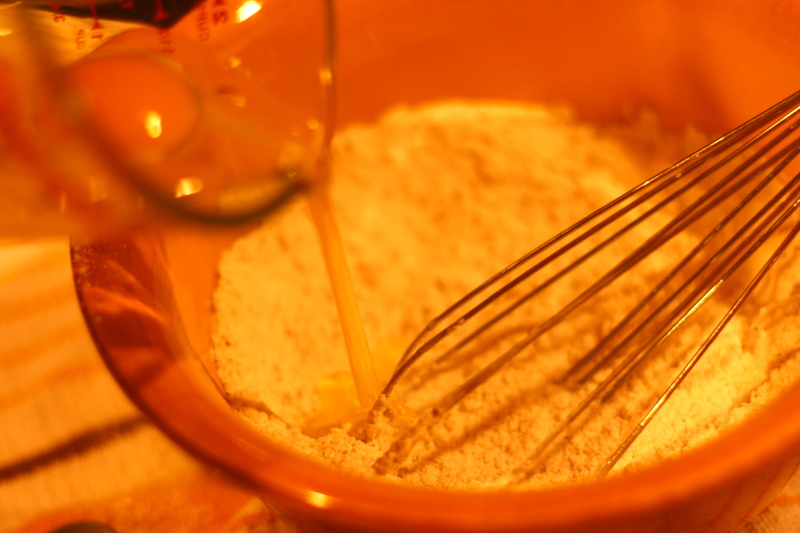 Combine 1 cup of flour, 2 teaspoons baking powder, 1/2 teaspoon freshly grated nutmeg, salt and pepper (to taste) in a bowl. 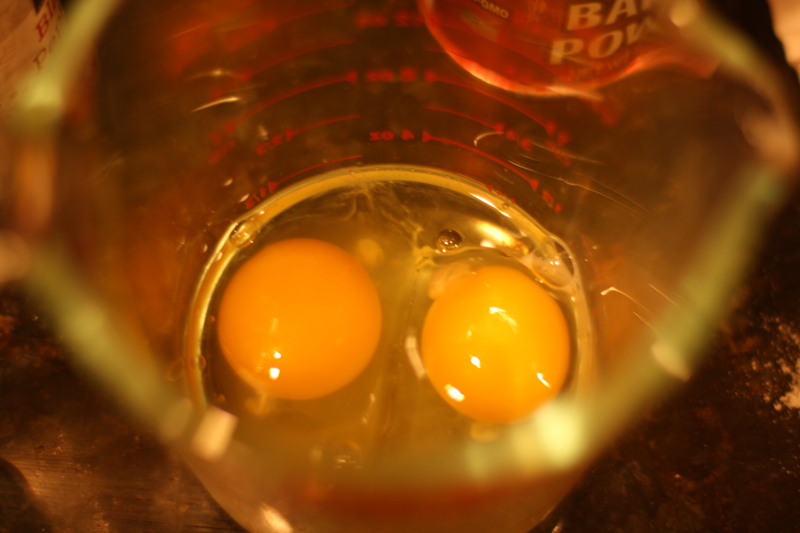 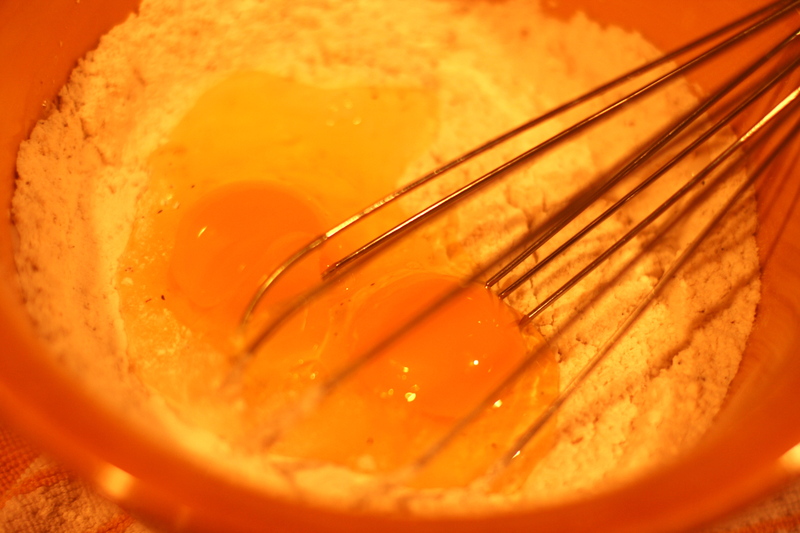 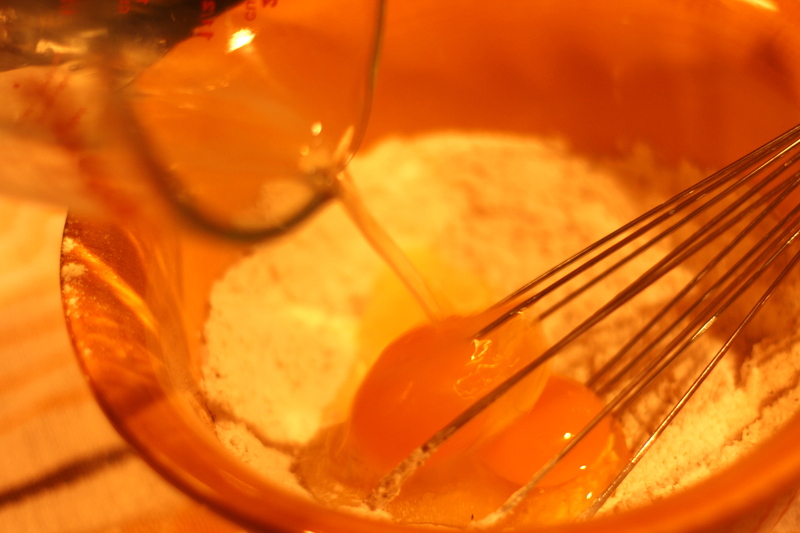 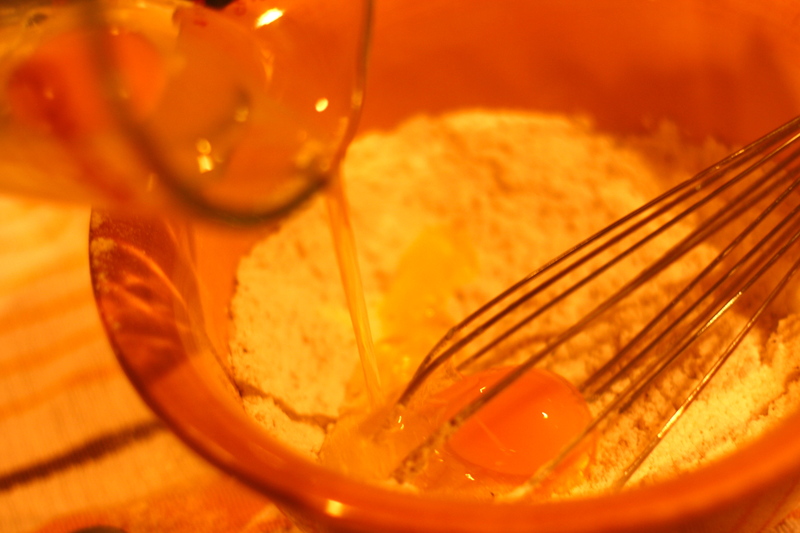 Then whisk in two eggs. 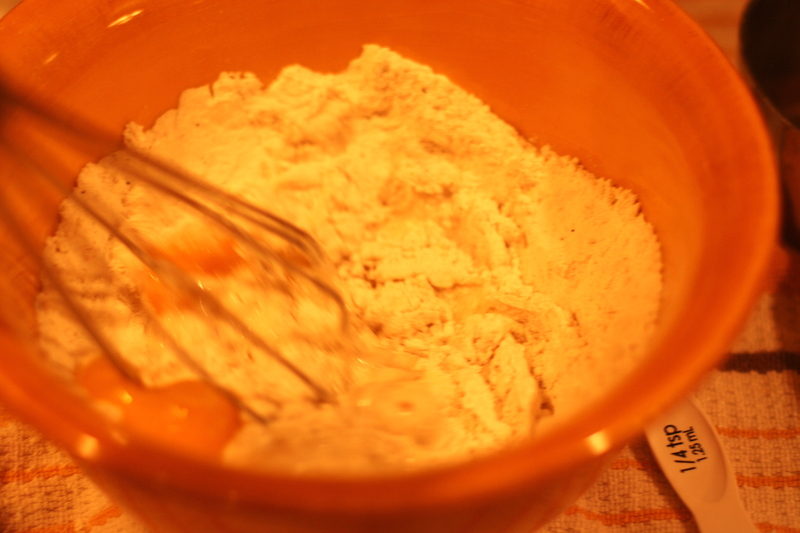 Batter will be lumpy (don't fret). 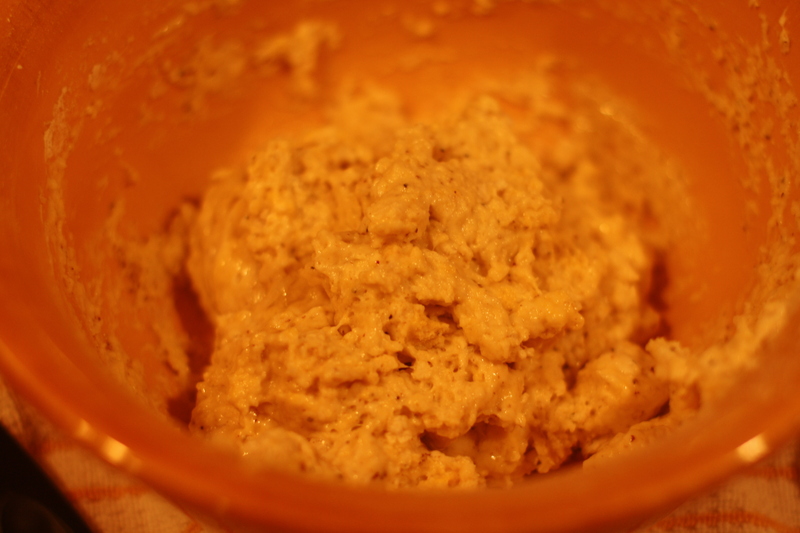 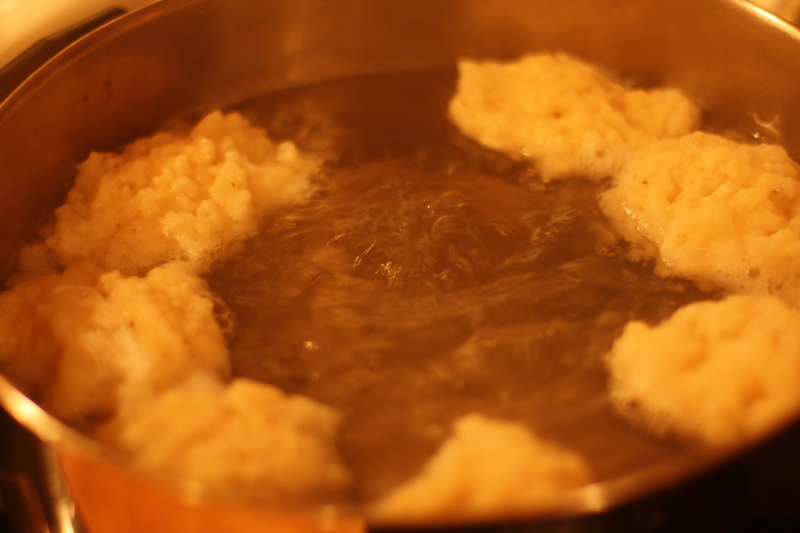 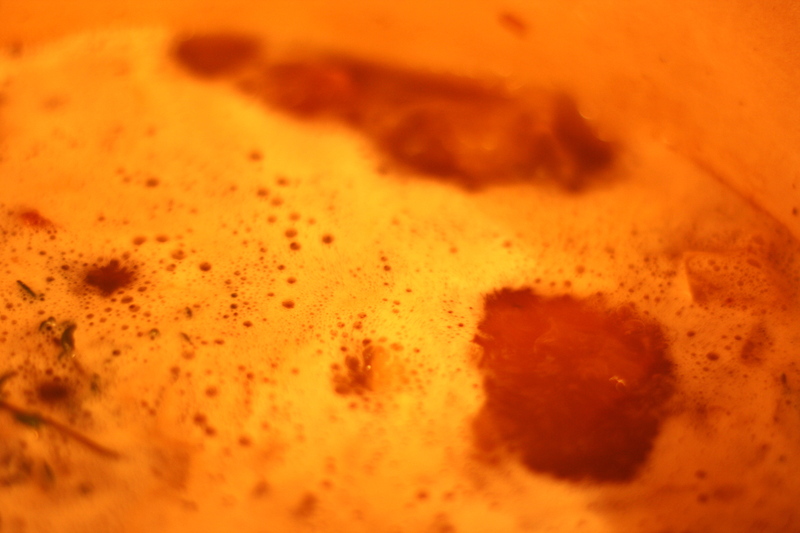 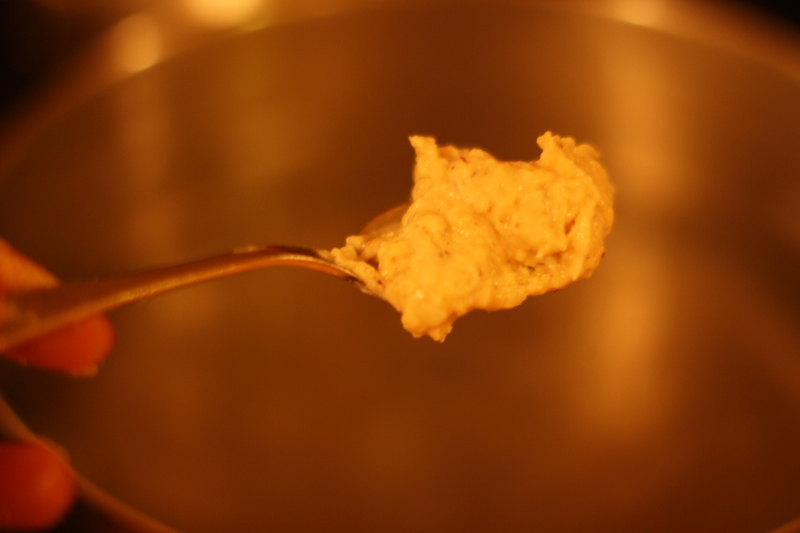 Then drop spoonfuls of the dumpling mixture into a heavily simmering pot of salted water. 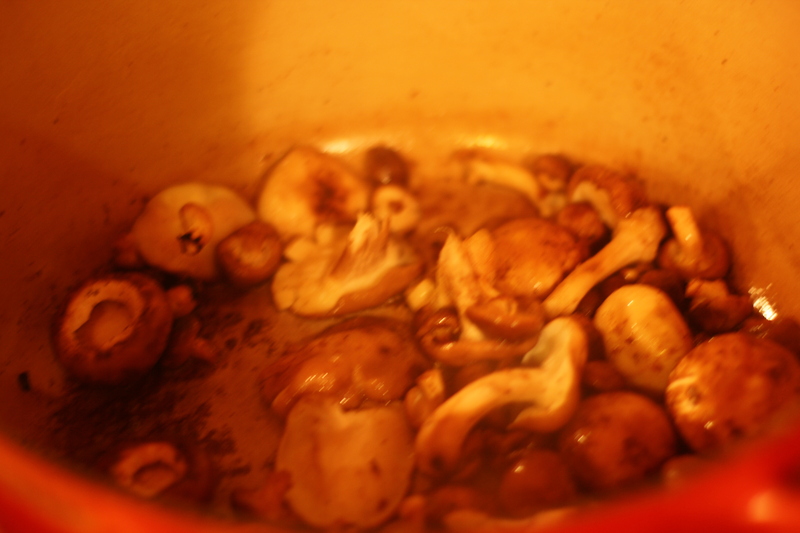 Cook for about 5 minutes until they puff up to double their size. 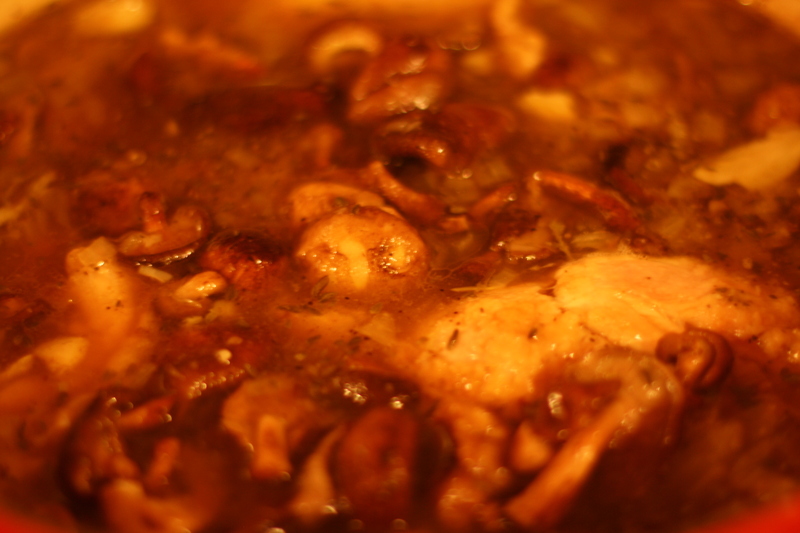 Return the mushrooms to the simmering chicken mixture. 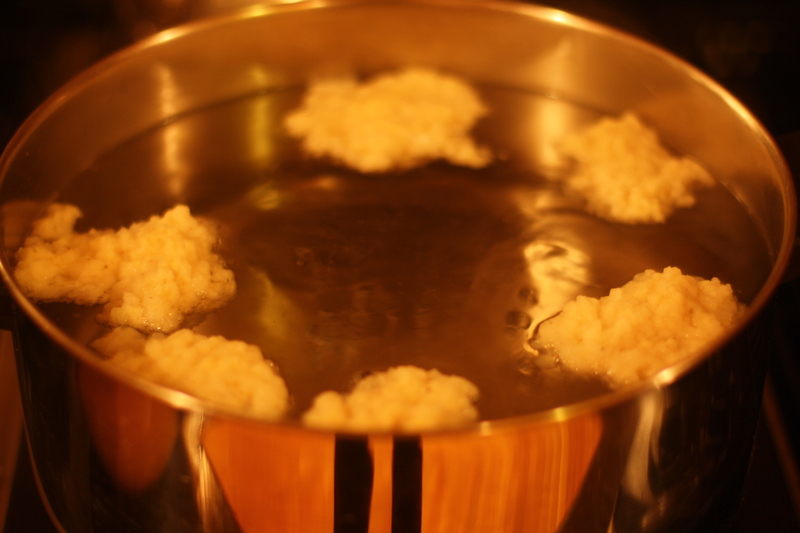 Add dumplings to bowl when the stew is ready. 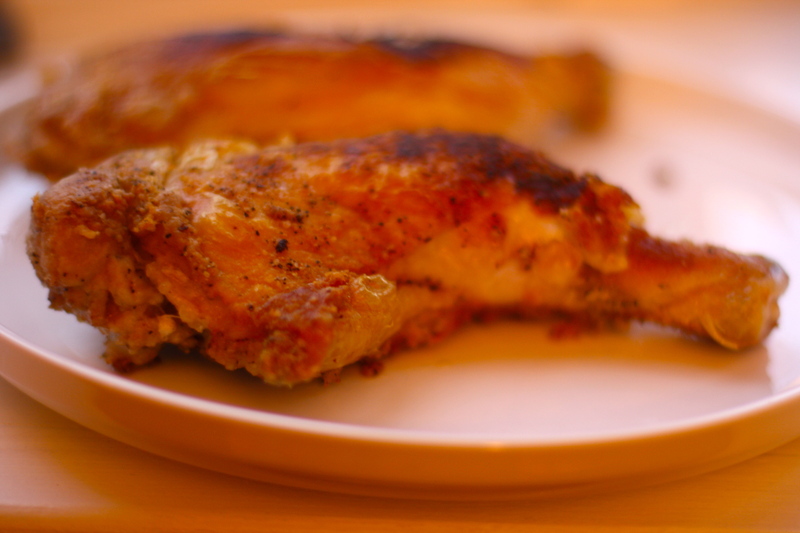 So as I patiently await the days of mouth-watering corn on the cob, and sun-kissed skin, I'll seek refuge in mouth-watering bacon and crispy chicken skin, in the form of chicken and dumplings.